We all have pet peeves… this one resonated with us! Have some thoughts to share? Post them on Front Porch Forum! I walk my dog daily around Leddy field and all over down to the beach etc. Some K9 walking friends and I have said the exact same thing. You are right on. They’re even on the beach. I will carry it till I find a bin to despose of it. Just to leave it on the ground is a combination of laziness and I can’t be seen holding a bag of my dog’s poop. 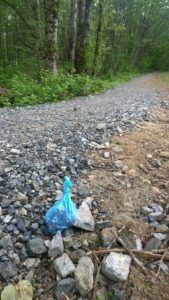 I’d also like to thank the folks whom are kind enough to put out bagged 5 gallon pails for everyone to put their dog’s bagged poop into along Leddy trails and some on the bike path. Very appreciated and convenient.